Russ Daniel isn’t new to the automobile industry. In fact, he has been in the auto industry since 1987. Russ relocated to Northwest Arkansas in 2007 to become the general manager of the Landers McLarty Ford, Chrysler Dodge Jeep Ram, and Nissan dealerships in Bentonville. Russ would later become the managing partner with Franklin and Mack McLarty at the Landers-McLarty dealerships in Bentonville. This milestone in Russ’ career was also a turning point for the group of dealerships that he now leads on a day-to-day basis as the managing partner for these 6 stores in Northwest Arkansas after the acquisition of 3 stores in February 2018. Renamed McLarty Daniel in July 2015, the auto group promises the same great service and community involvement that customers have come to know and expect. Russ focuses on the fact that his core family values translate into the success of his business, but he’s quick to say that at the end of the day, it’s about more than his personal success. He is in the car business to help others, whether they are his customers, employees or members of the community. Russ and his team realize the importance of giving back to the community in which they live and work, which is one of the many reasons the McLarty Daniel Group will continue to support community organizations such as the Miller McNeil Woodruff Foundation, the American Heart Association’s Paint the Town Red gala, the Northwest Arkansas chapter of Fellowship of Christian Athletes, and multiple area public and private schools. To see a more complete list of the organizations that we have partnered with click here. 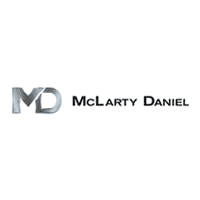 In February, 2018, McLarty Daniel expanded their operations in Northwest Arkansas to include the Buick GMC location in Bentonville, Arkansas; the Chevrolet location in Springdale, Arkansas; and the Chrysler Dodge Jeep RAM FIAT location in Springdale, Arkansas.